Public anger at the Government's discrepancy data reading and slow action to tackle the problems of the worst reading of the air pollution which hits beyond the World Health Organisation's safe limit chart in Beijing, China. Public anger in China at dangerous levels of air pollution, which blanketed Beijing in acrid smog, spread Monday as state media queried official transparency and the nation's breakneck development. The media joined Internet users in calling for a re-evaluation of China's modernisation process, which has seen rapid urbanisation and dramatic economic development at the expense of the environment. Dense smog shrouded large swathes of northern China at the weekend, cutting visibility to 100 metres (yards) in some areas and forcing flight cancellations. Reports said dozens of building sites and a car factory in the capital halted work as an anti-pollution measure. Doctors at two of the city's major hospitals said the number of patients with respiratory problems had increased sharply in the past few days, state media reported. "Now it has been dark with pollution for three days, at least people are starting to realise how important the environment is," said one posting on China's Twitter-like Sina Weibo. At the height of the smog Beijing authorities said readings for PM2.5 -- particles small enough deeply to penetrate the lungs -- hit 993 micrograms per cubic metre, almost 40 times the World Health Organisation's safe limit. Experts quoted by state media blamed low winds, saying fog had mixed with pollutants from vehicles and factories and had been trapped by mountains north and west of Beijing. Coal burning in winter was also a factor, they added. In an editorial Monday the state-run Global Times called for more transparent figures on pollution and urged the government to change its "previous method of covering up the problems and instead publish the facts". Officials in China have a long history of covering up environmental and other problems. Earlier this month a chemical spill into a river was only publicly disclosed five days after it happened, and authorities were widely criticised for initially denying the Severe Acute Respiratory Syndrome (SARS) outbreak in 2003. Official PM2.5 statistics have only been released for China's biggest conurbations since the beginning of last year, and expanded to cover 74 cities earlier this month. The tightly-controlled media has previously raised concerns over health problems linked to industrialisation. Observers say the statistics' increasing availability has forced them to confront the issue more directly. The Xinhua state news agency criticised the "pollutant belt" that had spread across the country and warned that the authorities' stated goal of building a "beautiful China" was in jeopardy. "A country with a brown sky and hazardous air is obviously not beautiful," it said. "The environmental situation facing the country will be increasingly challenging," it said. "There is no reason to be too optimistic." On Monday the Ministry of Environmental Protection announced measures to tackle the problem. It pledged to limit vehicle exhaust emissions and promote the use of clean energy as well as step up the development of public transport systems in urban areas, state news agency Xinhua said. The environmental watchdog also asked local authorities to increase their analysis of air pollution and publicise the results quickly as part of an early warning system for air quality, Xinhua reported. Smog levels eased in the capital Monday, with the national monitoring centre putting the PM2.5 AQI figure at 183, or "light pollution", in the evening -- although the US embassy gave it a "hazardous" 335. Levels remained high in many parts of China, with PM 2.5 AQI standing at 405 in Zhengzhou south of Beijing and 342 in Xian to the southwest. Share prices of environment-related companies surged, with face mask producer Shanghai Dragon soaring by its 10 percent daily limit. The smog dominated discussion on Sina Weibo. "This pollution is making me so angry," said one user, posting a picture of herself wearing a face mask. As Beijing chokes on its worst air pollution on record, observers may have noticed that the numbers from the city's new Air Quality Index are consistently lower than the numbers released by the US embassy. However, Chinese experts say that this discrepancy was expected, because the Beijing Environmental Monitoring Center is using a slightly different method to calculate the index, which it started publishing on January 1. In addition, the scale the Chinese are using stops at 500, while the US embassy is publishing higher readings. It is difficult to compare the US embassy and Beijing Environmental Monitoring Center's measurements of PM2.5, deadly fine particulate matter that is one component of air pollution measured by the AQI. The center does not keep a record online, but only shows the reading for the current hour. A spokesperson refused to give the data to the Global Times, referring the reporter to the website. At 3 pm Sunday the PM2.5 reading at the center's Agricultural Exhibition Center was 271, compared to a reading of 323 at the US embassy, about 1.5 kilometers away. At 7 pm, the reading was 290, compared to 343 at the US embassy. The environmental monitoring center uses 35 stations around the greater metropolitan area to gather pollution data, with both higher and lower readings than the embassy's. Questions about how the government measures air pollution are deadly serious. 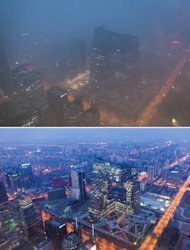 A study by Peking University and environmental NGO Greenpeace published last month says air pollution led to 2,349 deaths in Beijing in 2010, and the authors expect deaths in 2012 to reach 2,589 if the pollution level doesn't change. In 2007, a scientist complained that a World Bank report omitted data that found 750,000 people die prematurely across China from pollution. Qiu Qihong, an engineer of the Beijing Environmental Monitoring Center, said US and China use the same function to determine AQI figures from six different pollutants. However, he explained that the UStates uses a stricter system to determine what numbers to plug into the AQI formula. 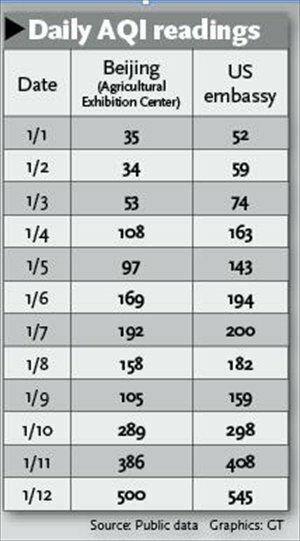 The formula requires a range of values of PM2.5 to calculate the number, and the US and China are using different ways to determine this range. Qiu explained, "The US uses a stricter system because their society is further along in the industrialization process." This is why when PM2.5 density is transferred to AQI figures, the two countries have different readings, Qiu said. For example, according to the standards published by both countries, if the PM2.5 density reaches 15.4 micrograms per cubic meter, according to US standards, the matching AQI figure is 50. But under Chinese standards, the density needs to reach 35 micrograms per cubic meter. Zhou Rong, climate and energy director of Greenpeace, said there might be a small difference between the figures and it shouldn't raise serious questions. She also supplied another reason for the value difference. "There are two steps of getting the AQI values. First you need equipment to measure PM2.5 density in the air, and the technical standards are different between US and China, so there might be a data deviation," she said. The NGO Green Beagle, frustrated with a lack of transparency by the government, started training citizens how to collect their own PM2.5 data in 2011. He Xiaoxia, a representative of the group, said the group could not provide its own data to compare to the government's own data. "We don't have data these few days, we'll have it in a couple of days. But the Beijing Environmental Monitoring Center has been updating their data. As of now we can only trust their data, the center has professional equipment and monitors in professional ways, it must be expert, why not trust their data? Our data, on the other hand, is only for reference." Zhou from Greenpeace praised the authorities' decision to release PM2.5 data as a big improvement in air quality monitoring. She doesn't question the data, but notes there are still issues to be dealt with. "The problem is now we have the data, the real diagnosis, how do we improve the situation. That hasn't been brought up completely on the local government's agenda," she said. The government did set a goal, but it's unlikely to reach it. In early December, the Ministry of Environmental Protection announced there should be a reduction of 6 percent in the level of PM2.5 pollution in Beijing. In December, Zhou told the Global Times the goal of a 6 percent reduction might not be attainable, saying, "Given the harsh fact that the average annual intensity of PM2.5 particles in most Chinese cities always exceeds the national standards, the expectation of improving air quality by 6 percent is still elusive." "The next step is to open up to the public on how to control the pollution, timeline and standards," she said. Beijing's new Air Quality Index that came into effect on January 1 replaces an opaque system put into place last year that measured PM2.5 using a scale that was hard to understand. The goal of the new AQI was to make air pollution readings more transparent. It came after years of refusing to measure PM2.5, hiding the true extent of air pollution. Efforts by the Global Times to determine how the authorities calculate the AQI have been stonewalled by environmental officials at the Beijing Environmental Protection Bureau and Ministry of Environmental Protection. On Sunday, Qiu directed the Global Times to a report called "Technical Regulation on Ambient Air Quality Index (on trial)," detailing how the index is calculated, on the official site for the China National Environmental Monitoring Center. Qiu also explained why the index stops at 500. "We consulted the standard in US and Europe when making the Chinese one. The American scale also stops at 500 according to standard, because 500 is a pretty high ceiling and can't be reached." Qiu noted, "According to standard, the US embassy should only publish 'above 500' and not an actual number." On Saturday the center's daily reading was 500, and the US embassy's daily reading was 545. The embassy's hourly readings topped out at 886. Public outrage over the choking smog that has blanketed a large part of China for more than 10 days has prompted many cities to shut down factories, ban the use of officials' cars and attempt artificial precipitation. Beijing's environmental authority has ordered a temporary halt in the operations of factories owned by 58 companies, including chemical companies and car manufacturer Hyundai. They have also been asked to cut down on pollution, officials said in a media briefing on Monday. Some 30 percent of the capital's official vehicles will be banned from the roads on heavily polluted days to cut down on emissions, the Beijing Traffic Management Bureau announced. "Traffic authorities will be monitoring these banned vehicles via their database and surveillance cameras," Fang Li, deputy head of the Beijing Municipal Environmental Protection Bureau, told the press. The ban started on Saturday, when the city's PM2.5 (particles less than 2.5 micrometers in diameters) Air Quality Index (AQI) readings exceeded 700, far beyond the upper limit of 500. The US consulate in Shanghai defines PM2.5 levels of 200 to 300 as "very unhealthy," stating that young children, the elderly and those with lung conditions should stay indoors. Fang said that the carbon emissions from traffic and industrial factories, the local climate conditions, and the impact of pollution from Tianjin and Hebei Province are three major causes of the sudden deterioration in Beijing's air quality. The smog has led to record-high air pollution readings, an increasing number of respiratory disease patient admissions and disrupted traffic across the country, including areas of Hebei, Henan, Shandong, Anhui, Jiangsu and Sichuan provinces. According to Xinhua, a traffic accident on the Shanghai-Kunming expressway Sunday, which killed one and injured nine, was related to the heavy smog. In addition, Dezhou, in Shandong Province, experienced a 30 percent higher rate of traffic accidents over the weekend. Amid public demands for more rapid government action on pollution control, several cities have released plans since the weekend. Many however, have yet to take any action. In some cities, such as Beijing and Shijiazhuang, some schools have cancelled outdoor activities due to the heavy pollution, and the government of Zhengzhou has started tougher inspections of construction sites and coal power plants to reduce emissions and dust. Environmental and meteorological authorities in Nanjing, where the air pollution has been severe for nine days, have been trying to stimulate artificial rainfall to ease the pollution. Nanjing's environmental officials also proposed a pollution-control plan to the municipal government, suggesting the activation of temporary traffic restrictions during heavily polluted weather, according to the Yangtse Evening Post. The smog in most places will last until January 16, the National Meteorological Center said. Pan Xiaochuan, a professor of public heath with Peking University, told the Global Times plans to deal with extreme pollution should have been established before the situation occurred so people could prepare for the worst. Currently, environmental protection laws are still not well enforced, while governments in different cities should enhance cooperation on pollution monitoring and control, Pan said, "or else China could have an outbreak of pollution-related social unrest and protests over heath issues." Medical experts have told the Global Times they worry the recent severe pollution in Beijing may exacerbate the annual winter flu outbreak. This winter, the main flu strain is still A(H1N1), often referred to as "swine flu" since it first broke out in Mexico in 2009. According to the latest release from the Beijing Centers for Diseases Control and Prevention (CDC), three people have died of A(H1N1) strain of flu since January 1. "The three patients had other diseases like cancer and asthma," said Pang Xinghuo, deputy director of the CDC. While the three patients died before the extreme pollution that has afflicted the capital since Friday, Pang said the smoggy conditions now will exacerbate the spread of A(H1N1), as it will negatively impact people's ability to resist the virus. "There are pollutants which are harmful to the respiratory tract and the cardiovascular system. And it's easier for the little PM2.5 particles to get deep inside the respiratory tract, which will aggravate the illnesses of patients who have diseases like asthma and pneumonia. So people's ability to resist the flu virus will be degraded," Pang said. In addition, it is hard for respiratory viruses, including the flu, to disperse when the air is stale and has more pollutants, she said. "If a flu patient sneezes, the virus in the smoggy air will stay for a longer time than usual. So other people passing by have a higher possibility of breathing the virus in," noted Pang. 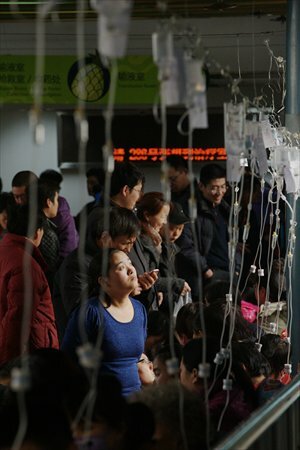 A nurse, surnamed Cheng, from Beijing Hospital in Dongcheng district, said that the number of patients seeking flu treatment has risen, and their staff has been affected. "We are short-staffed more than usual now due to flu," she said. "People have to wait for about two hours on the waiting list to see emergency doctors here while in ordinary days, the waiting time is just about half an hour," Cheng said. Doctor Zhong Nanshan, renowned Chinese respiratory disease expert and head of the Guangzhou Institute of Respiratory Diseases in the First Affiliated Hospital of Guangzhou Medical College, told the Global Times that there is no proof that PM2.5 particles can transmit the flu virus. "However, for patients who catch it, breathing the particles will aggravate the disease, because PM2.5 can penetrate the respiratory tract, and also the [lung] alveoli. For those who have other diseases, their ability to resist the virus will be lowered," said Zhong. 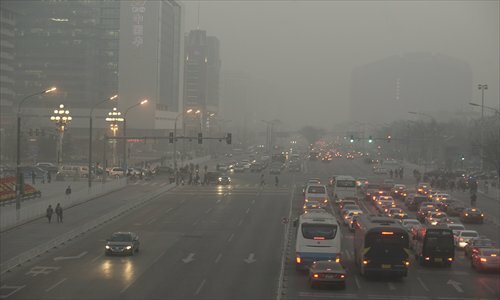 Ma Yanming, media officer of Beijing Municipal Health Bureau, agreed that the conditions could be harmful. "However, we don't have any figures for the A(H1N1) patients because we can't survey all flu patients," said Ma. Beijing Municipal Environmental Monitoring Center showed that on Saturday, PM2.5 was over 700 micrograms per cubic meter at some stations, and peaked at over 900 micrograms per cubic meter in some areas. The World Health Organization indicates that PM2.5 over 25 micrograms per cubic meter is dangerous to the health. In the latest CDC release, from December 31, 2012 to January 6, 2013, it is estimated that in above second-class medical institutions in Beijing, 30,077 patients came for flu treatment. The number is 3.88 percent higher than the previous week's 28,567 flu patients. Pang said the flu in Beijing is different from the flu epidemic now spreading in the US. "H3N2 is the main strain of flu in the US; in Beijing it's H1N1," she said. According to the Xinhua News Agency Sunday, so far 30 US states have had deaths due to the flu, most of whom were aged over 65 or children. This US flu season has peaked weeks earlier than usual, and has tipped over into an epidemic, the New York Times reported Friday. Pang said that so far the flu is controllable in China because the A(H1N1) strain has not mutated. From July, 2009 to January 17, 2010, 10,966 people caught A(H1N1) in Beijing, and 76 people died, according to the Beijing News on January 6. "People should pay attention to personal hygiene. Children and the elderly should wear more clothes and schools should conduct regular temperature checks," Pang noted. A vaccine for this winter's flu is still available in hospitals and clinics in Beijing, and the elderly and children are vaccinated for free. Other people should pay at the clinic.